On June 27, a column by Tom Brodbeck in the Winnipeg Sun called out the Parliamentary Budget Officer, the Canadian Centre for Policy Alternatives and myself for allegedly “[trying] to scare Canadians.” He said we were wrong when we predicted higher numbers of prison inmates and higher costs as a result of the tough-on-crime agenda. There had been “no big surge of inmates” in federal prisons, and “taxpayers don’t have to worry about spending billions on new prisons,” according to Mr. Brodbeck. Here are the facts. First, when we made our predictions about numbers and budgets back in 2010, we expected the government to live up to its obligations under international law and create new prisons to house the expected increase in numbers. (Under international law, there should be no more than 500 inmates housed in a prison.) The government chose instead to close three federal prisons (housing 1,000 inmates) and build 2,700 cells in existing prisons (for a net gain of 1,700). Then it double-bunked the rest. About 20% of federal prisoners are now living two or more to a cell. This solution is inhumane and dangerous, but cheap. In addition, we predicted that some of the harsher crime laws would produce many more motions and appeals, thus adding to the cost of administering justice. We did not, however, expect that the Supreme Court of Canada would overturn laws so often and with such dispatch, thus negating many of the worst effects of the tough-on-crime agenda. The justice system also found ways to circumvent the harshest of the laws, thus further avoiding longer sentences and higher costs. For example, the two-for-one law would have made remand prisoners serve longer sentences, as would the mandatory minimum sentence for firearms offences. The justice system first found ways to lessen the impact of these laws and then allowed appeals in some cases. Then the Supreme Court took the laws off the books altogether. Offenders are spending less time in custody as a result. We are still awaiting the full impact of mandatory minimum sentences for drug offences. These will now incarcerate many people who would normally have received a non-custodial sentence, thus adding to the numbers in prison. It is impossible to predict what the Supreme Court might do in response to these sentencing changes, but we do know that it has noted the lack of evidence that mandatory minimums serve any useful purpose. The operating expenses of Correctional Service Canada have in fact ballooned under the Conservative government. In the first five years of its mandate, there was an 86% increase in federal prison costs from $1.6 billion to $2.98 billion. According to Statistics Canada, criminal justice spending overall increased nationally by 23% between 2002 and 2012. And last year (2013/14), operating expenditures for both the federal and provincial/territorial systems cost $4.6 billion, an increase of 5% in just one year (adjusted for inflation). These are large increases, particularly as the crime rate in Canada has been dropping steadily for over 25 years. And no, the government cannot claim credit for the decrease. The trend to lower crime rates was well-established long before the Conservatives came to power. As well, other countries have been experiencing lower crime rates at the same time. More importantly, the necessary comparison is between the increased inmate population and the crime rate. As noted, the crime rate has been decreasing since the 1990s. 2014 had the lowest crime rate since the 1960s. In 2014, all provinces and territories reported a drop of 9% in the Crime Severity Index (CSI) over the previous year. This was the 10th year reporting a decrease in the CSI. Yet in 2012, Howard Sapers, the federal prison ombudsman, reported that the federal in-custody population had increased by 1,000 over the past two years—an “historic high.” Meanwhile, in 2013, the province of Ontario was expecting its daily count to be up by more than 1,500 within two years as a result of tough-on-crime laws. In 2014 the Auditor General (AG) stated that half of the prisons were at or over their rated capacities. (Mr. Brodbeck claims that they are under capacity overall. My money is on the AG.) As well, the AG points out that plans to expand prison capacity are coming to an end, so we can expect overcapacity to continue into the future. He says the overall prison population is up 9% since March 2010, the approximate date when new tough-on-crime legislation began to go into effect. A large part of the increase in the prison population is accounted for by the fact that fewer prisoners are being released on parole under the current government. Releases on parole have decreased by 14% since 2009—a significant decrease according to Howard Sapers. 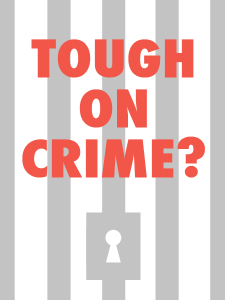 There will be consequences to the tough-on-crime agenda. Because of double-bunking and harsher conditions in the prisons, as well as the frustration of inmates being denied parole, there has been a significant increase in incidents of self-harm, violence and use of force by correctional officers. Mr. Sapers’ most recent statistics (2014) show an increase in inmate assaults of 17% over the last five years, and an increase of 56% in instances of self-harm. Use-of-force incidents increased almost 20% in one year (between 2013 and 2014). Segregation is also being used at an alarming rate. And crowded conditions provide perfect conditions for contagious diseases to proliferate. Thus, HIV/AIDs and Hepatitis C are rampant within the prisons, and these will spread to the street as inmates are released. This year is an election year. The correctional budget was recently reduced in order to help balance the federal books. This means that the usual rehabilitative programs will not be available to many inmates. Even fewer of them will be paroled out. As well, because of overcrowding, inmates are being released straight to the street from maximum and medium security institutions—not an optimal plan if the objective is to reduce recidivism. And they are going to be your neighbours. They will have endured violence and inhumane conditions. They will have received little or no treatment for mental illness, drug addiction, prior sexual abuse and other problems. And they will feel that they owe nothing to a society that treats the least of its citizens with unfairness, inhumanity and contempt. Paula Mallea is is a Research Associate with the Canadian Centre for Policy Alternatives, and the author of Fearmonger, a critique of Stephen Harper’s tough-on-crime agenda. Her latest book, The War on Drugs, discusses the illegal drug trade and the failure of the so-called “War on Drugs” to stop it. This is riddled with assumptions vis-à-vis cause and effect as reasons for increased violence. And nonsense about lack of programs and other interventions in the federal prison system. Those of us with intimate knowledge of “the system” cringe at the media’s unrelenting half-truths offered as comprehensive facts. No wonder the public gets unnecessarily alarmed. Those of us with intimate familiarity of the people impacted by “the system” cringe in frustration at the apologists’ tireless efforts on behalf of the status quo. The reason the public gets “needlessly alarmed” is because the political propaganda is designed to instill fear and panic that allows the “tough on crime” agenda headspace, and because drama and horror sells better than compassion.